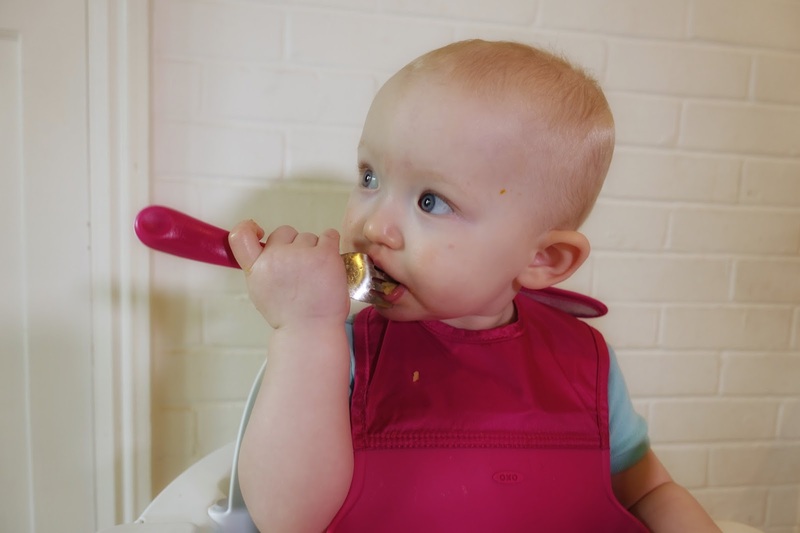 Oxo Tot kindly sent us a training plate, roll up bib and cutlery set to review recently and it seemed like the perfect opportunity to move Little on to the next stage of weaning. 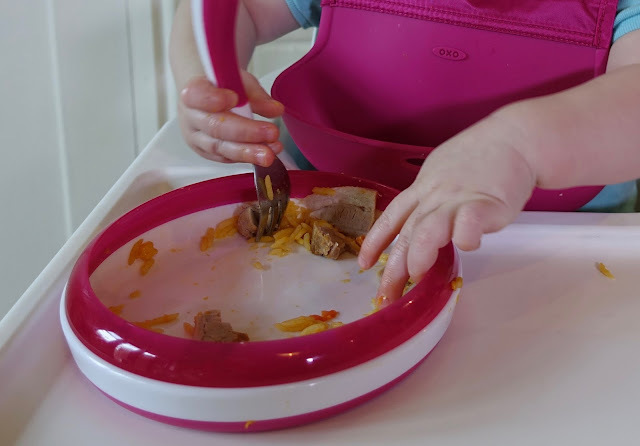 Our normal approach to meal times from day one has seen us putting a small amount of food on the highchair tray so Little can pick it up and feed herself (baby led weaning). If giving Little yoghurt or anything really runny which will be wasted if eaten just using her hands I preload a spoon and pass it to her, but I hadn’t given her the chance to scoop food up herself. According to my scan of Google results babies are meant to be able to use a spoon to feed themselves from about a year old, but this obviously varies hugely from one baby to another. It also depends on them having the time to practice and I suspect many parents aren’t prepared to face the increased mess 3 times a day. It takes children a little longer to learn to use a fork and they should be able to feed themselves with one around 18 months. This surprises me because once food is successful stabbed onto a fork it is easier to get to the mouth than anything on a spoon. I put Little in her highchair with the fork and spoon a few minutes before bringing her food over to give her a chance to explore the cutlery. 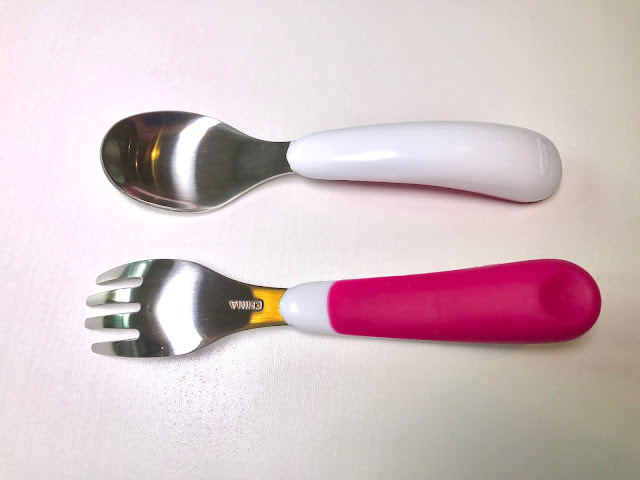 The Oxo Tots spoon and fork have a nice chunky curved handle made from white plastic and pink silicone. The silicone on the handles help make them easier to hold without slipping and the shape and balance of weight helps little hand to hold them. The stainless steel ends of the cutlery are curved to make scooping easier and the fork has rounded prongs so there is no need to worry about accidentally stabbings. They even have a flat bit on the end of the handle to stop them rolling. Once the novelty of the cutlery had slightly passed I put the bib on Little. The bib has a wipeable nylon top half and a soft silicone lower part with a wide ‘crumb catcher’. 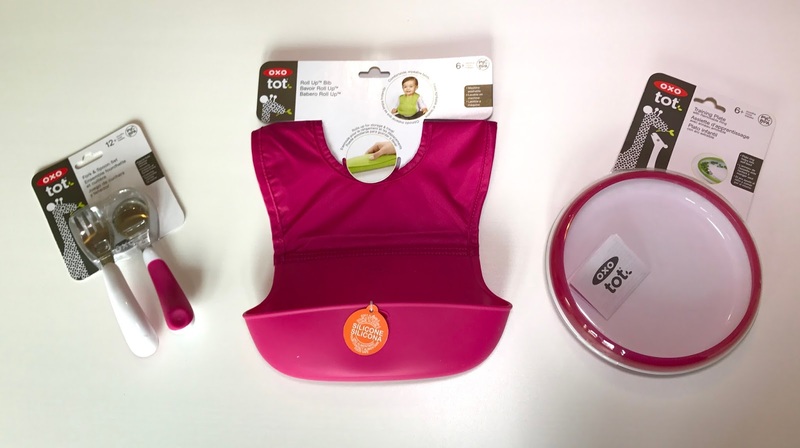 The reason for the two materials is so the bib can be easily rolled up and clipped closed making it easy to fit in a changing bag and take out with you. There is a wide piece of soft velcro to secure the bib behind babies neck and making it adjustable for a growing child. The bib can be wiped clean, but is also machine washable if it needs a bit more cleaning. I brought over Little's lunch on the plate. The plate is circular and made up of a base plate and a removable ring. The ring increases the height of the sides of the plate and it curves inwards to stop food being pushed off the plate too easily. When learning to use cutlery the ring can be kept on to guide food onto the cutlery, and then removed when they are more proficient. The plate is a great size with enough space for a meal for a toddler, but small enough to fit on to smaller highchair trays. The base has the same non slip silicone as the cutlery to stop it sliding around too much, but it doesn’t have suction to secure it in place. The plate can go in the microwave if you need to reheat food quickly. The style of the plate compliments the cutlery and I think it looks pretty cool, I love the bright and simple designs of the Oxo products. I gave Little rice and pork so she had something she could try and scoop up with the spoon without too much mess (if you are feeling lazy rice vacuums or sweeps up really easily when dried). We showed her how to stab the pork on to the fork so she could feed it to herself. She had a bit of a go with both and was a big fan of the fork which she used to scoop up rice more than the spoon. She still used her fingers during the meal to assist her eating, but this will reduce as she gets more used to the cutlery. I think she did well for a first try, check out the video. 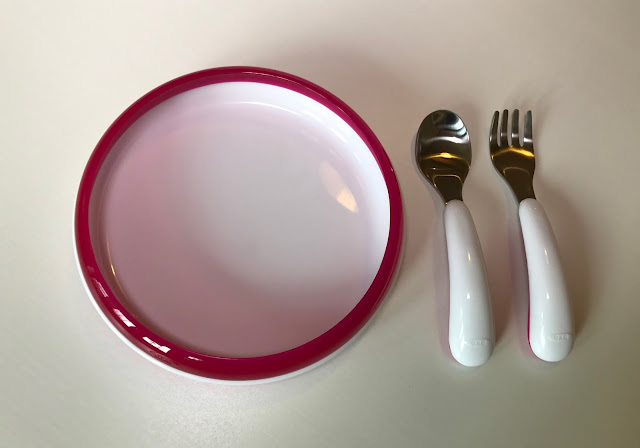 The cutlery and plates can go in the dishwasher to be cleaned and they are BPA, Phthalate and PVC free. Like all plastic plates and bowls I have used the plate does get scratched by the cutlery, but I would rather mild scratching than repeatedly replacing a plate after breaking from being dropped or thrown on our tile floor (a risk with both ceramic and melamine crockery). 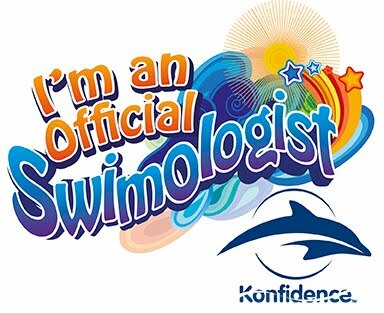 We were sent the set in raspberry (a lovely bright pink), but they are also available in Green and Aqua (blue). The bib looks brilliant - I think we need to get one as ours is huge!! 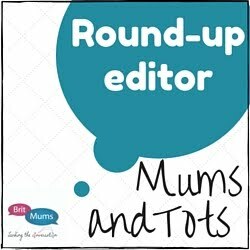 We LOVE Oxo tot, we still use our bib and cutlery now two years on. The bibs wash so well too and no amount of spag bol stains them! That plate looks great I wish I had them when the girls were little would have saved so much food flying off and onto the floor!